This week has been a very challenging and emotional week. Tuesday saw a great gathering including lots of Leeds fans pay their respects at Trev Horsley’s funeral. Thursday was the anniversary of my daughter Charlotte’s death and the end of radiotherapy/chemotherapy treatment for my husband Phillip and yesterday saw the anniversary of the murders of Chris and Kev in Istanbul. I also heard today that Andy Ramshaw one of my Selby Whites died this week too and thoughts are with his family and friends. The last couple of days I found a lot of anger in me that sent my stress levels soaring which culminated in me having a massive meltdown. The one good thing about following Leeds United is the support network from our fans. For those who took time to ask how I was, my husband was, spoke about football, look forward to my blog, follow me on Twitter/Facebook or have bought my books, my heartfelt thanks go to you all. You know who you are and as always your support is greatly appreciated. We had a lot of nervous fans heading to St Andrews today. As it is still too early to build my hopes up, I was just going to wait and make my judgement at the ground. From my point of view and many others, the only way we can guarantee promotion is to go up automatically. Having been disappointed three times in the play offs, I don’t know many fans who would fancy our chances doing it that way. The team: Casilla, Ayling, Cooper, Jansson, Harrison, Phillips, Klich, Bamford, Alioski, Roberts and Hernandez. Subs: Dallas for Harrison (45), Roofe for Bamford (70) and Clarke for Klich (70). Leeds lost the game 1-0. Attendance was 24,197 with 2,781 Leeds fans. On the 19th minute, Leeds fans en masse turned their backs to the pitch for a minute in memory of Chris and Kev, as those who were at the game did all those years ago, as it should never have gone ahead after what had happened. It was a game that I’d been too scared to attend so my friend Karen went without me. I just want to mention the Leeds United mascot who was brilliant. He came to the Leeds fans doing the salute and was a credit to the club. Leeds came close early on and had plenty of possession but the one thing we couldn’t do, was get the ball in the net. The referee showed his credentials early on by missing an elbow on Robert’s head plus other pushes but was quick enough to give free kicks the other way for less than he let go with us. The linesman to the left was useless too because despite some things happening right in front of him, he ignored them. All this does is giving the opposition the impetus. We limited Birmingham to one attack and should have taken the lead when Bamford got to Ayling’s cross and the ball looked as if it was going straight into the net. Sadly for us it hit the post and bounced back into their keeper’s arms. To make matters worse, Birmingham raced to the other end of the pitch in front of the Leeds fans and put the ball into our net to take the lead within a minute of our attack. The case of taking your chances when they are there came back to bite us quickly as we went into the break a goal down. The second half saw Dallas come on for Harrison and we really should have equalised when he put a cross over to the middle for Bamford to fire over instead of into the net. That was a chance we should have taken. Bamford was really unlucky with his next chance when the keeper made a fantastic save from his header. On another day he could have had a hat trick! As time went on it looked more and more likely that we weren’t going to score despite the possession we were having and had Casilla to thank for making a couple of good saves to keep Birmingham from increasing their lead. Whilst there was only a goal in it we stood a chance of getting back into the game. As it was Norwich had a convincing win to stay top of the table and Sheff Utd won to leap frog back above us into second place as we slipped down to third. Today had that déjà vu feeling about it; we’ve been here that many times before and promotion is not going to happen. Although a lot can happen between now and the end of the season, until it is mathematically certain one way or another I won’t raise my hopes. The one thing we do still have though is a chance so only time will tell what happens. It was a disappointing game for us today as we weren’t really in it collectively as a team. We may have had a lot of possession but unless we are peppering the opposition’s goal with shots and putting them under pressure it counts for nothing. With Preston away on Tuesday evening, only a win will do for us. As we are driving to this one, we won’t get there until nearer kick off so hopefully the traffic will be fine and we get there on time. One thing that really disappointed me this week was the club’s decision to stop season ticket holders from being able to buy any tickets for the last game of the season against Aston Villa. Only Gold members were given the opportunity to buy one ticket each. I was going to purchase some in the family stand for my daughters and granddaughters to come to the last game of the season as usual. I stand by my argument on WACCOE that this decision should not have been made for this season but for next as they changed the goalposts at short notice. As part of the agreement for buying a season ticket at the start of the season, there was priority booking for home games. The club have not looked at the wider picture or the impact that decision has had on fans who have made plans to attend this game. It has really hit our overseas fans hard as Norwegians, Hungarian, Dutch, Irish and even a lady from Argentina have found that very few of them can now get a ticket for the game. 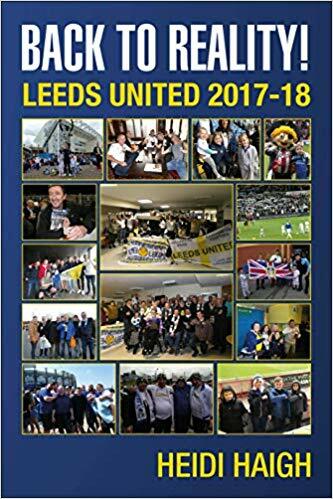 As they make plans well in advance to attend any game at Elland Road, they book flights and accommodation to get the best prices. The decision has also impacted on families where a parent has brought their child all season on their membership, but now cannot bring them as they don’t have that all important Gold membership. That to me is wrong. I can try and get my granddaughter a ticket but there is no way she is going into the family stand on her own! There again knowing my luck I’d be unsuccessful anyway as I have been unable to buy any extra tickets when they have gone on sale all season. The only way I’ve managed to get any was when some tickets have come back up for sale. Part of my personal issues has seen trapped nerves in my back and degeneration of my back and hip. At least I know why I’ve been getting the pain but they are just more things I could do without in the never ending story with my family. The saying things can only get better couldn’t be more apt for us and Leeds United. Don’t let us down please – see you at Preston, LUFC – Marching on Together.